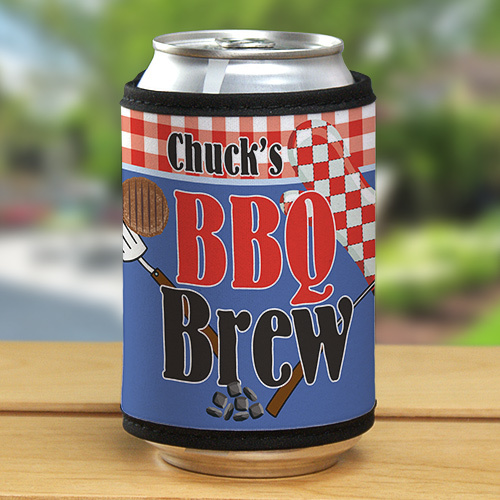 Grilled food, cold beer and great times are sure to be had the next time you fire up the BBQ and enjoy a cold one using this Personalized BBQ Brew Can Wrap. Our Personalized Can Coolers make great summer party favors and are unique personalized housewarming gift ideas. Our Personalized Can Wraps are great for Birthdays, BBQ's, Fourth of July, Summer, Father's Day, Valentines Day, Grandparents Day & Christmas. They keep your favorite drink cool on those warm summer days. Give a unique Can Wrap to dad as a wonderful Personalized Father's Day Gift Idea. He is sure to also enjoy our BBQ Grill & Chill Personalized Can Wrap and our Personalized King Of The Grill Apron to make barbequing with family and friends a lot of fun.